At the moment I am very much involved in Living Labs. Living Labs are an important development in research, design and development. At the core of the living labs idea is that the gap between design and reality is growing. More and more products and services have social networking aspects or location aware functionality. These aspects are very hard to simulate in a normal laboratory like Home lab at Philips. Amsterdam Living Lab is the initiative that we are starting in, surprise, Amsterdam. Here we are changing Amsterdam in a large scale laboratory, together with Waag Society, University of Amsterdam and Telematica Instituut. Together we try to create new design, develop and test processes based on real life user experience. For this measurement tools and sensor to measure reality will be developed and new design processes that take this real life data into account. More locations in the Netherlands are developing such an approach. Living Lab Leiden is involved in development of wireless services, Rotterdam Climate Initiative is developing new approaches to saving energy. Approaches that take the real life behaviour of people into account. For the Innovatieplatform I am working a plan to strengthen this ecosystem of initiatives and promote the capabilities national and international. Next week the Innovatieplatform is organising a big day on innovation in the Netherlands. I am organising a track on Living Labs there too. Several Living Labs are present and some demo’s are given. So if you are interested, drop me a line. Meet you on third of December in Rotterdam. Banks are of course very much the focus of the news these days. One of the interesting news items a journalist found out is that Google already has a banking license in the Netherlands. Bank are potentially one of the sectors that will change a lot because of business possibilities that a technology like SaaS will enable. Competition will come from completely new sectors because they are better at reaching the market or using the “intelligence of crowds”. While searching a little further I found this blog post from Jeff Jarvis where he is asking for examples of bank services that Google would be very good at. Examples are peer to peer lending, more transparency around transactions in stocks, open source platforms to increase functionality (E-invoices anyone?). In a way Google checkout and it’s competitor PayPal are already on the move. In my view banks really have to start thinking on how to really innovate their processes through which they create value for their customers. This is very interesting picture that shows the difference between the opportunities for saving energy between Europe and the USA. I do not think there are many households in the Netherlands that do not use a programmeable thermostat, often even integrated with a outside temperature sensor. This is something we have to keep in mind when comparing research on energy saving between the USA and Europe. who does not know the feeling of feeling utterly silly when sending an e-mail in which you say that you are enclosing an attachment after which you forget to include the attachment. I know it happens to me and most people around me. But Google is paying attention! They now have a new function where Google scans the text of you e-mail and when it thinks you intended to include an attachment it gives you a reminder. I think this is a nice example of paying attention to your users and deliver services that are based on looking what people are really doing and what really goes wrong while doing it. Some time ago I bought an iPhone and I must say I love the user interface. It all feels very slick, every function does what you think it should do and looks very nice. However, I recently downloaded an iPhone app from the NOS that shows you teletekst directly on you iPhone. very convenient. However, I was wondering myself that it is quite a remarkable that this application for the iPhone is that popular. It is a user interface designed for TV’s with minimal interaction and minimum use of graphics. Of course the original idea was that through this simple view and interface it was easy to use and easy on the hardware. All reasons that are completely not valid on the iPhone platform. I wonder where the popularity comes from. Is it because people are used for so long to this interface or are minimal interfaces more powerful than we think anyhow? Amazing..
We all know we have to be very careful with energy due to the warming up of our planet, dependency on energy from areas in the world you do not want to be dependant on and other reasons. But we also know that it is very hard to find the incentives to stimulate people to save energy here and now. Problem is that there is too much of a time lag between the action to save energy and the advantages acquired. Recently I held a key note presentation at the conference “Greening the enterprise 2.0“, focused on how to save energy in office environments. Especially in offices it is hard to stimulate people to save energy because they do not have to pay the energy bill themselves. Automatic systems are usually circumvented (people open windows in completely controlled buildings because the intelligent control mechanism for temperature is less intelligent than the maker thought) and therefore seldom delivers the result that we think of beforehand. And people are lazy. The picture on this post is from my own re-chargers in my office. I once placed a switch there to switch of the electricity. 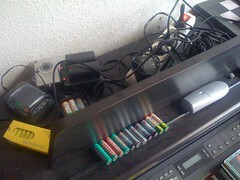 But after two cases of dead batteries that I needed at that moment I always have it switched on. Focus of my presentation was how to use social networking aspects to stimulate people to save energy. By sharing best practices but also by more direct feedback on individual actions and results (and some peer pressure maybe …). IBM is developing some quite interesting applications around lotus connections dealing with social networking. Recently they have developed a tool called Atlas that is capable of showing you your network, how it relates to the subjects you are dealing, with and how to reach people. Important is that this information is also showed in relation to the company structure and (other) communities. What I especially like about developments like these is that it gives the individuals in an organisation the power to create their own network besides the structure of the organisation. Links are being made that work instead of links that are made to control power (or am I being naive and will it still be used to do that?). I think due to the transparancy it will give the individual more power to reach his goals based on achievement instead of organisational position. People can create their own organisation that supports their work within the overall organisation. This leads to fascinating possibilities. Of course their are lots of questions on how this will work. How do we deal with privacy, will the organisation not use the transparency to discipline people instead of giving them more freedom. What is the role of management in structures like these? This morning I wrote about social networking and all the good things it may bring us. Stay in contact, meet old friends and things like that. After that I received this email from plaxo. One of my freinds, John will have his birthday on December 14th. Nice to get a reminder (I am terrible at reminding things like that) but where will this bring us? My first idea was: hey we could automate this and send the card by itsel so you will never forget another birthday. I can imagine being called by a friend: He Martijn, thanks for your card. Me: What card, what for?